I am delighted to bring you another great giveaway from Uprinting.com. Greeting cards are not only great for Holidays, but they are great to send out to your friends to let them know that you are thinking of them or to Thank them. 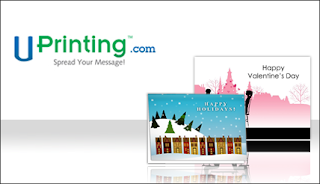 Uprinting.com allows you to make custom greeting cards by adding personal photos, graphics, logos, pictures and personal messages. The goal of customizing a greeting card is to create a uniquely personal greeting card that reflects the creativity of the sender. These are definitely cards your family will want to keep! If you want to take it up a notch, Uprinting.com also does Envelope Printing. These would be great for wedding correspondence or even everyday mail. Giveaway ends 5/12/10 at 9pm EST. Giveaway is for US residents only. You must be at least 18 years of age to enter. No P.O. Boxes. Winner will be chosen randomly. Winner will be contacted via e-mail and then will have 48 hours to respond before a new winner will be chosen. I love the gallery wrapped canvas. Thanks for the giveaway. I like the postcards - can never have enough of those for quick notes! I love their return labels! I'm also a fan of their stretched canvas! The Wall Graphics that UPrinting offers are really neat idea. The wife and I are artists and we would use many of these items to promote are art business. Thanks you so much for hosting this giveaway. We could use a vinyl banner for work. And finally, following on google friend connect as kycouple2000. The card calendar looks neat! I entered the snorg t's giveaway!